Is Cannabis the New Cool for Autism? We read the review article entitled “Cannabidiol for the treatment of drug-resistant epilepsy in children: current state of research” by Anderson et al with great interest. We found it interesting to elucidate a few aspects of possible beneficial effects of cannabinoids in autism, with consideration that coexistence of autism and epilepsy is quite common. Autism is a severe neurodevelopmental disorder, presenting with stereotypic and repetitive behaviors, impairment of social communications and impaired reciprocal social interactions. Despite the recent growth of public awareness and research funding on autism over the past decade, the pathogenesis is still a matter of debate which makes curative therapeutic interventions unattainable. 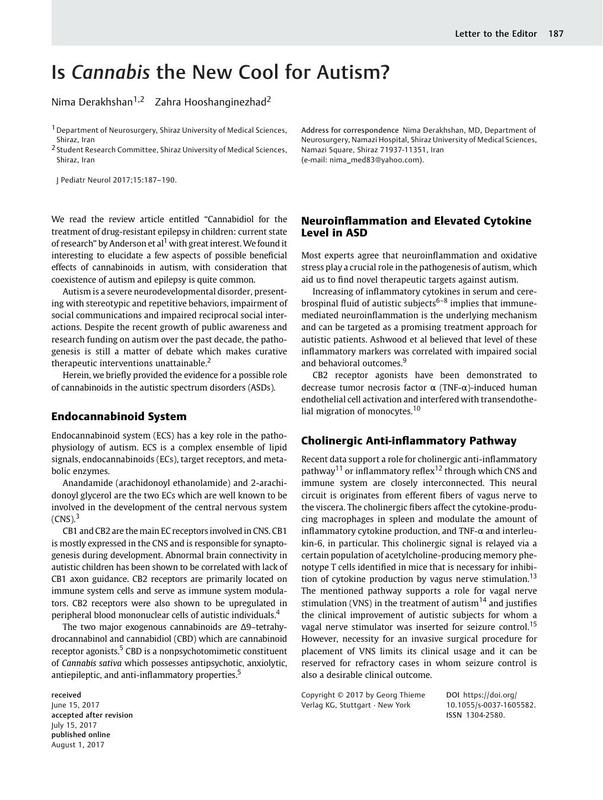 Herein, we briefly provided the evidence for a possible role of cannabinoids in the autistic spectrum disorders (ASDs).